If you follow me on Facebook or Twitter, you know I’ve been battling with my blog all day. (FYI, GoDaddy responds very quickly to Twitter inquiries.) When I was finally able to log in, I was so happy, I was almost in tears. So there is no question about today’s “happy”. My blog is back and in one piece. I’m excited to bring you my first TOS review in 2014! I’m more excited to share that it’s for a chore planner that’s actually usable and helpful! I’ve tried different systems over the years, but I couldn’t stick with anything. Email-based programs didn’t work for me, because I get too much email anyway. The reminders would either get lost or become overwhelming. I tried using task managers in calendar programs to set up daily tasks, but that became cumbersome and overwhelming. Paper wasn’t going to work, because I hate to waste paper. I didn’t want to make a new list every day. 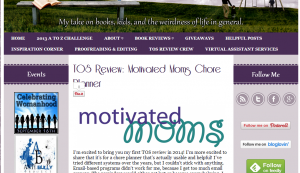 Then, thanks to TOS, I discovered Motivated Moms. The planner is available as an ebook or an iOS app. A few weeks before our review period started, I downloaded the iPhone app. It’s available in a paid version, with more features, or a two-week free trial. I got the trial, because I just needed to know if I liked it enough to apply for the review. The app is great. 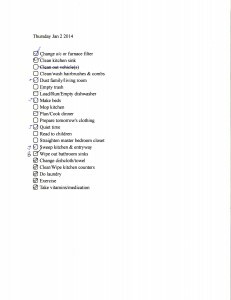 You can color-code the tasks, and things move off the page as you check them off, so they’re not in your way.But I’m not the only person in my family, so I wanted everyone to be able to see the list. Fortunately, you can print from the app. If you have a wireless printer connected to your phone, it’s super-easy. If not, I’m not sure how that would work. There are Crew members doing full reviews of the app. You can read those more more information. Except for the printing, I loved the app! Specifically, I loved the system. It’s broken down into daily, weekly, monthly, and annual tasks. (Probably some quarterly stuff, too. I didn’t dissect the task list. That’s why I have the planner.) It’s all there as part of your list for each day, so you don’t have to go to a separate page for less-than-daily chores. The planners all come with the option to include a daily Bible reading plan. Planners are also available in color or black and white. I was originally going to send the ebook to Office Depot to have it printed and put in a 3-ring binder, but I decided to just print it at home one week at a time. Had I actually had the whole thing printed, I might have actually noticed that there is a two-week menu planner at the back. Probably not, as it’s at the back. It’s in the description of the planner; that was something else I missed. I just wrote that week’s dinner menu on the side of the page. So, I’d print out the week’s task list, and mark off the things we didn’t need (like watering plants). I’d use a highlighter to color-code the remaining items. Some things weren’t coded if there were things that anyone could do as needed, like taking out the trash, or things we all do, such as taking vitamins. 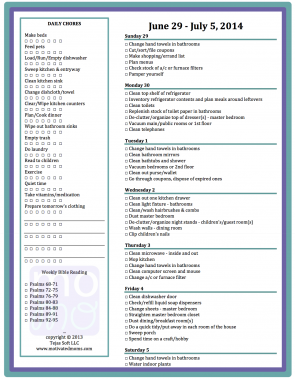 This weekly Chore Planner lists all the daily chores in one section, with a checkbox for each day. The boxes aren’t labeled, but I just jotted the days of the week at the top to help us keep track. 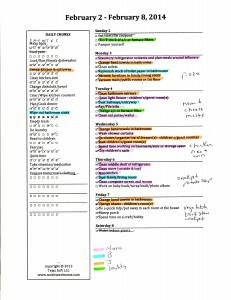 Individual days’ tasks are listed on the other side of the page. As you can see, we didn’t get everything done every week. No perfection here! Another good thing about the week-at-a-glance page is that you can do extra things if you have time or pick up an uncompleted task later in the week. And if you don’t get to something, you know it’ll come around again, and you can do it then. I love that it has tasks like “clip children’s nails” (if you’re like me, you notice that when they start looking like Dracula), “pamper yourself” (I have to! It’s on the schedule! ), and order credit report (does anyone remember to check those regularly?). My biggest accomplishment while using this system was cleaning out my purse and wallet. I clean out my purse every few months, but apparently it’s been a really long time since I cleaned out my wallet. I found my voter registration card. From our former address. Where we lived ten years ago. I should do that more often. Too bad I didn’t find any hidden money in there. I did find it confusing that every other week, “plan menus” was on the Sunday list, but “inventory refrigerator contents and plan meals around leftovers” was on the Monday list. Wouldn’t it make more sense to either do them both at the same time or at least get check the leftovers before planning the week’s menu? The only thing I didn’t like about the ebook (which isn’t a complaint, really, because it’s an ebook, and this is kind of obvious) was that I couldn’t remove the items that don’t apply to us, as I could with the app — like feeding the pets. Unless you count the kids, we don’t have any pets. It wasn’t a big deal; I just marked those things off. 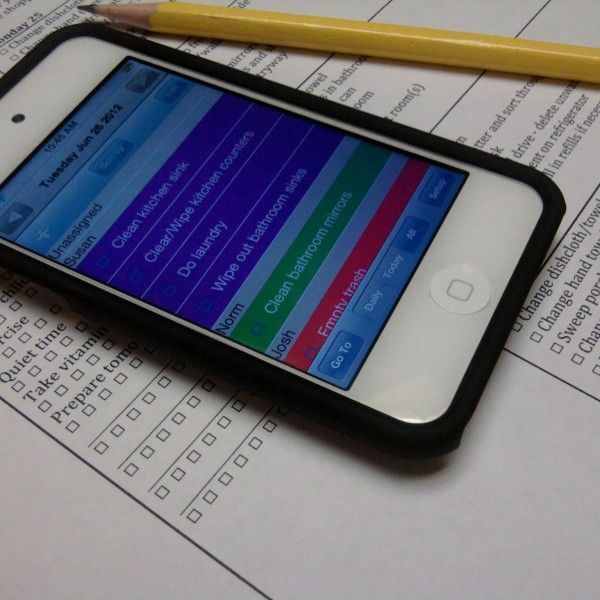 It’s just something to consider if you’re trying to decide between the app and the paper planner.